If only heating a home were as simple as gathering everyone around the fireplace. Putting in baseboards is the next best thing - a simple, cost-effective solution that won't noticeably alter the look or feel of your rooms. They are designed to blend, safe to use and don't take up space. Installing baseboards is one of the most efficient ways to stay warm because it allows you to heat only occupied rooms, saving money and energy. They're a perfect choice for smaller, frequently used spaces like a home office or apartment. Determine what type of baseboard heat to install by first considering your options. Basically, there are two different types to choose from: electric and hot water baseboard heaters. Some home owners have their units customized to fit design needs or irregular spaces. There are commercial units that offer higher power than residential models. Electric models come as individual units and provide wamrth by room rather than through one central unit. These are smarter than other types of space heaters because they are engineered to radiate warmth utilizing airflow principles. Since the temperature is programmed on a room by room basis, the whole family gets to sleep more comfortably. Those who prefer cool temperatures can set their thermostat for 65 degrees while someone in the next room may want to set theirs at 70 degrees. The energy saved adds up significantly for both your budget and comfort. The difference between electric and hot water models (also known as hydronic baseboards) is in the source of the warmth. As the name implies, hot water units use central water heating. Essentially, hot water runs through pipes that are connected to each unit to quickly warm a room. The nice thing about this type is that it continues to put out gentle heat even after it's turned off, so no energy is wasted. The reason for this is the liquid inside the pipes stays warm for some time after the system is turned off. Thermal elements retain and deliver this warmth through a simple convection flow. The design is similar to radiant floor heating, in which water pipes radiate warmth through the floors. With hot water baseboard heaters you get similar results minus the more technical installation and higher price tag. 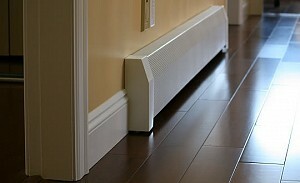 Price is bound to be a factor when deciding what type of baseboard heat to install. Electric is the way to go if you're on a tight budget. You don't have to have a central system and there's no costly duct work involved with the installation. Though more efficient than other kinds of portable models, they're not as sophisticated as hydronic ones. You're going to spend more on both hot water baseboard units and the installation, but these systems are often more efficient than even central heating systems. The ideal combination is hot water units in addition to radiant flooring, but if the flooring isn't an option, these systems are a comparable alternative. While electric ones offer more temperature control on a per-room basis, the warmth from hot water systems can be inconsistent. Since the energy source is the boiler, each unit pulls warmth from the water as it runs through the system. As a result, the first rooms to receive heat will get warm fast while the last rooms will take longer to warm up. Add flow control valves to the system during installation in order to balance out energy distribution. The answer to what type of baseboard heat to install will vary depending on your budget and personal preferences. If you're taking the installation on as DIY project, keep an eye out for paintable one-size-fits-most covers to incorporate the look with your d�cor.